If you’re planning to acquire a window cleaning robot to finally liberate yourself from one of the most dangerous and cumbersome house cleaning jobs, there is a good chance that you've been considering one of the best and most popular window cleaning robot brand available today: ECOVACS WINBOT. When you get one of these robots, there will be no need to take anymore the risk of climbing dangerous ladders to clean outside those tall and hard to reach windows. ​ECOVACS makes a number of window cleaning robots, and this article will compare the most popular and best rated by Amazon customers, so that you can select the right one for your home's cleaning needs. In this article, we will be comparing WINBOT 830, WINBOT 850 and WINBOT 950 which were the most popular Among the Amazon customers at the time this article was written. At the end of this article, we will also introduce another popular robotic window cleaner made by COP ROSE which is the first window cleaning robot that comes with an app. Selected Window Cleaning Robots on Amazon. They can be used to clean automatically different types of glass windows: frosted, colored or tinted windows and even Thermopane windows. They can also be used to clean sliding glass doors, shower stalls, glass railings and more, inside or outside. Using a thorough 4-stage cleaning system, these robots can squeegee and wipe in every direction. This helps to fully contain the cleaning solution and leave the windows streak-free and sparkling. They follow a Z-shaped cleaning path for wide, horizontal windows, and an N-shaped cleaning path for tall, vertical windows. The automatic cleaning path allows the robot to clean efficiently and thoroughly. 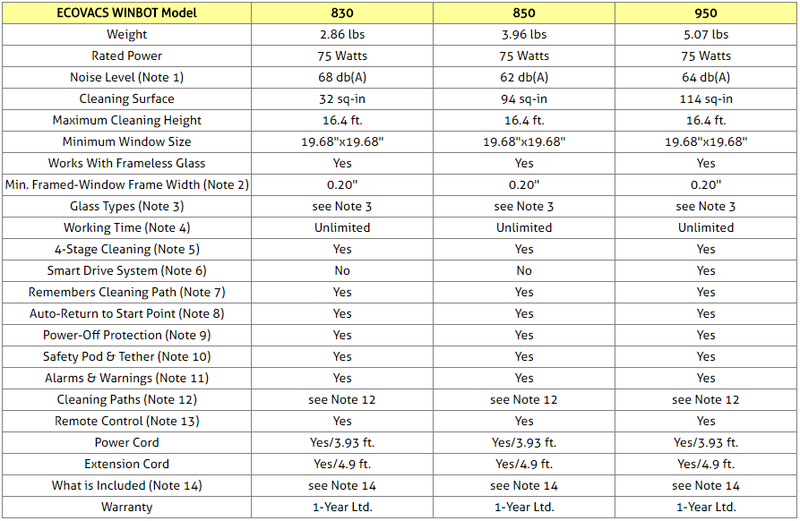 Thanks to the extension cord that is included in the purchase, these robot can clean very large windows of many shapes and sizes (see size restrictions in comparison table below) . They are equipped with back-up battery power, a safety pod and a tether, as well as edge detection technology to avoid any accidents and mishaps. Indeed, if a WINBOT's main power supply is interrupted, the on-board back-up battery takes over until the problem can be resolved. And even if it is very unlikely that WINBOT will fall off a window, the safety suction pod and tether it is equipped with are more than capable of preventing a fall, even if the robot somehow detaches from the glass. 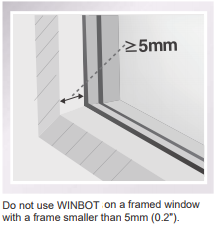 Edge detection technology is standard in all WINBOT robots, so no matter whether the glass is framed or frameless, it automatically knows how to avoid going over any edges. Multiple hi-tech sensors enable these robots to identify the edge of the glass, and change direction without interrupting interrupting its cleaning. This is especially useful for mirrors and glass balustrades. Pathfinder Technology automatically scans and calculates the size of your windows, mirrors or other glass surfaces that need to be cleaned, then programs a custom path for maximum cleaning speed and efficiency. ​These robots are very user friendly: With an intelligent operating system, simple 3-step operation and a handy remote for convenient control, they are designed for your ease-of-use. The remote control allows you to conveniently start, pause and manage the direction of your WINBOT from a distance! WINBOT robots know when they have finished the cleaning and return to the exact place they began the job where they can be held and easily removed from the glass. Each WINBOT robot also remembers where it left off after a pause, and resumes cleaning from that same spot so that it can efficiently clean your windows. ​When these robots need to communicate, they use both visual and audio warnings to get your attention and tell you what the matter is. This means you can look away and do other things while your windows are being made to sparkle. WINBOT robots clean at a low noise level so you can continue what you were doing largely uninterrupted. Finally, these robots are great mainly for maintanance cleaning to keep your windows sparkling clean, but not for windows covered with heavy dirt accumulated over a long period or after construction. In addition to the above listed features, WINBOT 950 features the proprietary SMART DRIVE system, which allows the handle of the robot to rotate 90 degrees, leaving the cleaning pad stationary. Thus, WINBOT 950 can move freely on the window, choosing the most efficient cleaning path. This greatly improves cleaning effectiveness and coverage! Thanks to a square body and SMART DRIVE technology, cleaning corners and edges poses no problem. There should be at least 5.9" (15 cm) clearance between the glass and obstacles in the room like curtains or furniture. WINBOT robots can clean horizontally mounted glass, but only when using the direction control buttons on the remote-control device (automatic mode should not be used). WINBOT robots can clean glass mounted at an angle, but may not operate normally; in such cases, someone should be in the vicinity to assist should there be a problem. WINBOT robots should not be used upside down. 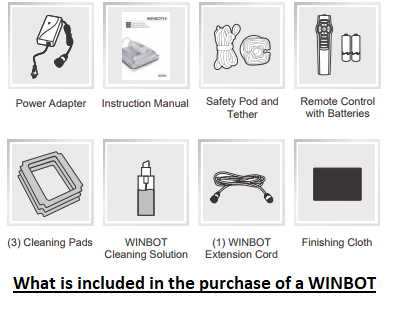 WINBOT robots should only be used with WINBOT Cleaning Solution which is included in the purchase. Using other cleaners significantly reduces WINBOT's performance and can damage the robot. WINBOT robots can be used to clean automatically different types of glass windows: frosted, colored or tinted windows and even Thermopane windows. They can also be used to clean sliding glass doors, shower stalls, glass railings and more, inside or outside. Because WINBOT robots are connected to a power supply when they run, they can be run as long as you feel needed. You can simply STOP the robot when you think the window is sufficiently clean. Using a thorough 4-stage cleaning system (see image below), WINBOT robots squeegee and wipe in every direction. This helps to fully contain the cleaning solution and leave the windows streak-free and sparkling. SMART DRIVE system, available only on WINBOT 950, allows the handle of the robot to rotate 90 degrees (see image below), leaving the cleaning pad stationary. Thus, WINBOT 950 can move freely on the window, choosing the most efficient cleaning path. This greatly improves cleaning effectiveness and coverage! Thanks to a square body and SMART DRIVE technology, cleaning corners and edges poses no problem. Each WINBOT remembers after a PAUSE where it left off before pausing and resumes cleaning from that same spot so that it can efficiently clean your windows. Each WINBOT robot knows when it has finished cleaning and returns to the exact place it began for your comfort and safe retrieval, where it can be held and removed easily from the glass. Each WINBOT is equipped with back-up battery power, so that if a WINBOT's main power supply is interrupted, the on-board back-up battery takes over until the problem can be resolved, and the robot is prevented from falling. When a WINBOT needs to communicate, it can use both visual and audio warnings to get your attention and tell you what the matter is. This means you can look away and do other things while your windows are being cleaned. When invoked in automatic mode, WINBOT robots follow a Z-shaped cleaning path for wide, horizontal windows and an N-shaped cleaning path for tall, vertical windows. The automatic cleaning path allows the robot to clean efficiently and thoroughly. Note that the remote-control device for WINBOT 830 and 850 gives you the option of requesting Z-shaped or N-shaped cleaning, while the remote-control device of WINBOT 950 gives you only the option automatic cleaning, in which case the robot automatically decides which type of path to choose for the most efficient cleaning ("N" or "Z" cleaning path). - START - It starts an automatic cleaning cycle. - PAUSE - It pauses the robot; when you restart it will continue from where it paused. - N-PATH - "N" cleaning mode is best for tall windows. - Z-PATH - "Z" cleaning mode is best for wide windows. ​- START - It starts an automatic cleaning cycle. The robot automatically decides which type of path to choose for the most efficient cleaning ("N" or "Z" cleaning path). - Directional Buttons - Four buttons that allow you to direct the robot to move forward, backward, left and right. So which of the three robots should you buy? The three WINBOT window cleaning robots considered here all come with those must-have features that a good window cleaning robot should have, such as being able to handle different types and sizes of windows and all types of glass, being equipped with multiple safety features to prevent mishaps, and being user friendly thanks to a simple to use remote-control device. So, you might be quite satisfied with the performance of all three if you have regular size windows. ​But if you have large windows or large terrace doors, you might one to choose WINBOT 950 which is equipped with the largest cleaning surface. A larger cleaning surface on the robot means that you will finish faster the cleaning of your windows. Note also that WINBOT 950 has the SMART DRIVE technology which allows the robot to move freely on the window, choosing the most efficient cleaning path, greatly improving cleaning effectiveness and coverage. Finally, keep in mind that these robots are good mainly for maintanance cleaning to keep your windows sparkling clean at all time, but not for windows covered with heavy dirt accumulated over a long period or after construction. Please click the window cleaning robot of your choice below for price information or to purchase. ​Uses vacuum absorption to cling to the glass. Can be used on framed and unframed glass, textured or horizontal glass, frosted, filmed or colored glass. Can also be used on wood, smooth tables, walls, tiles, etc. Equipped with anti-drop algorithm, the maximum tested safe height being 30m. Uses smart move navigation that avoids obstacles intelligently with 3 cleaning patterns that can be controlled using the remote. Simple 3-step operation: Spray, Power on and Start. The cleaning speed is about 4min/m2. Comes with a remote-control unit. Comes with a safety rope and has built-in battery to deal with power failure situations. Comes with 12 pieces washable and replaceable fiber cleaning cloth that can be used about 180 times. Can be used with any kind of cleaning liquid, such as liquid soap, laundry detergent, etc. Comes with an Android or iOS mobile app so it can be controlled from a smartphone or tablet. Adapter, extension cable and user manual included. Measures 12.5 x 10.2 x 6.7 inches.